An opticle recognition program for windows. Saves on typing. Shareware, please register. Character Recognition program that is also Shareware. Please read this file first. continue to use it, you are expected to register. encouraged, subject to certain conditions. to remove the program from your computer. the use of CODEREADER 1.0.
make changes or modifications to the software. engineer the software in any way. into the PATH statement in your AUTOEXEC.BAT file. and refer where necessary to your DOS manual. 1. Go to the DOS prompt. 5. Now extract the program files. refer to the WINDOWS USER GUIDE. Make sure the scan is straight. Adjust the brightness of your scanner if necessary. Use the -/+ keys to shrink/Enlarge bitmaps. continue to use it to register. two different persons at the same time. 1. You will be sent the latest version. 2. You will receive a printed manual. upgrades to major new releases. to clear before goods are dispatched. Where did you get your copy of CODEREADER? and save yourself some time and effort. Print and Read the file README.DOC. Move the text output to your text editor. Hide/Show the Ribbon and Status bar. Load it into the program. Adjust the options as necessary. Move the text to your text editor. Select part of the bitmap for processing. programming and let your scanner do the typing. CODEREADER is designed for Microsoft Windows 3.1.
program that you should be read. 2. using FILE-RUN option in program manager. 3. double-clicking ocr.exe in file manager. window like that of other Windows programs. now see the main window of the program. CODEREADER into your source file. go through the process step by step. probably learn what scans well and what doesn't. this point. You will know how to prepare bitmaps. format. Also it only reads monochrome files. scan and hence the accuracy of the recognition. the clipboard. The choice is yours. Once the bitmap is in CODEREADER you can now OCR it. and shrink it until you can see the entire bitmap. You can now select part of the bitmap and OCR it. area and apply the OCR program to it alone. disk or sent to the clipboard. onto your disk during installation. this (see your Window's User Guide for help). 1. Select OPEN from the BITMAP menu. 2. Use the key sequence ALT-B-O. 3. Use the key combination CTRL+O. displayed in the main program window. Once you have opened a bitmap you can process it. 1. Select RECOGNISE from the ACTION menu. 2. Use the key sequence ALT-A-R.
3. Use the key combination CTRL+R. correct them at this stage. 1. Select SAVE from the TEXT menu. 2. Use the key sequence ALT-T-S.
3. Use the key combination CTRL+S. A dialog box will appear. Type in the filename, e.g. MYTEXT.TXT and save the file. system can be saved to disk if necessary. they can be turned on or off as required. enlarge option to reverse the process. reversed. The program can do this. off the option to select areas. been halted it can be restarted from the same point. some of the options were not correctly set. future use after giving them a name. persistent errors in recognising certain characters. As the program executes an OCR it provides feedback. informed of actions as they take place. recognition. Another turns the trace on or off. correctly - perhaps some touch or are broken. to help deal with each of these situations. have been removed from the screen. the contents of the Edit Box. contents of which can also be saved to disk. program always uses the last set of options saved. This section tells you what each option in the menu does. particular processes: recognise, halt, exit, etc. manipulate bitmaps: open, paste, rotate, etc. manipulate the text: cut, paste, save, etc. change how the program presents information to you. editor, to hide the status line, etc. programs: it enables you to find help quickly. Use: Starts the OCR process. Precondition: Loaded bitmap, valid template. Use: To load a bitmap file. is used to select a filename. Use: To save a bitmap file. Use: To clear the current bitmap. cleared at the same time. Precondition: A bitmap in the clipboard. Use: To rotate a bitmap. Use: To flip a bitmap. Action: Flips a bitmap vertically. where a bitmap is upside down. Use: To open a text file. open an ASCII text file. Use: To save a text file. Precondition: Text present in the editor. Precondition: Text prseent in the editor. the editor to the clipboard. selected text from the editor. Use: To delete text in the editor. not placed in the clipboard. Precondition: OCR performed on bitmap. OCR directly into the clipboard. various parts of the screen. Use: Hide/Show the bitmap window. therefore have a larger editor. Use: Hide/Show the Edit window. Use: Hide/Show the Status line. line if it is currently off..
Use: To display a compressed bitmap. Precondition: Reduction factor less than 16. Use: To enlarge a reduced bitmap. Use: To turn the Tool Box on or off. and off if it is currently on. Boxes section of this manual. Use: To turn the Font Box on or off. Use: To turn the Error Box on or off. bitmap window on or off. Use: Displays the result codes. the result of the OCR. Use: Turns the trace on or off. character as it is processed. Use: To set the level of feedback. Use: Displays the help contents. the help file of CODEREADER. Comments: Used to access the help system. Use: Displays help about using help. to use the help system itself. to it whenever you have any difficulties with any box. tools and buttons for frequently used commands. Use: Turns on or off area selection. left of the selected area. right of the selected area. Precondition: Bitmap has been processed. the quality of an OCR. recognised by comparing them against the template. Precondition: Current template not the last. Precondition: Current template not the first. Use: To select the template font. to select the one required. Use: To clear the template. Use: To save the current templates. be used on future occasions. This box is used to make modifications to fonts. Use: To display the current font. broken or touches a neighbour. Use: To bypass a mismatch. moves on to the next one. largest block that is free. displays the last error that occurred. Use: To display error messages. been removed from the screen. what the buttons in the ribbon do. Use: To start an OCR. Comments: Used to start the OCR process. Use: To abort an OCR. stop an OCR before it finishes. Precondition: Text in the editor. after an OCR has finished. Comments: Used to quit the program. 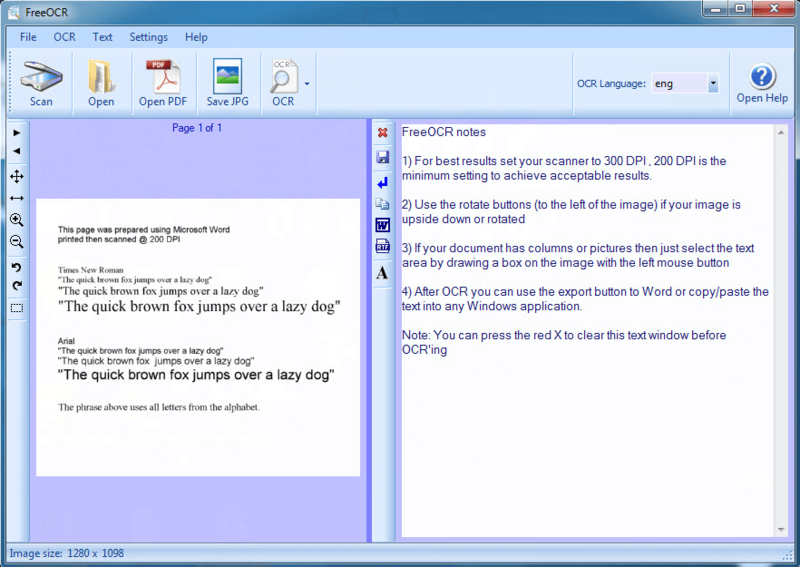 monitor the progress of an OCR. position as that in the bitmap. This section describes the contents of the status line. and the progress of various operations.